Schatjes is a basement space smackity-dab in the middle of the Red Light District of a city called Amsterdam. Schatjes exists for two reasons. First, we provide wall space to local, up-and-coming artists on which they may exhibit their art. You’d be forgiven for thinking that this makes it a gallery; Schatjes is merely a place like any other in the sense that its four walls fulfil their primary function of keeping the roof from falling on the floor, but in this case those walls have been embellished (/impoverished) with visual expressions of various semi-evolved apes. If you still believe that this constitutes a gallery, then sure, it fits the paradigm but we still like saying tomato instead of how you say it: tomato. Second, we host events. These include game and data jams, tiny concerts, movie viewings, debates, poetry afternoons, play readings, and more. They are the result of ever-evolving iterations of new and existing ideas, as interpreted and organized by a diverse group of enthusiastic people. See our homepage for past and upcoming events. Response: In the unique and wonderful Dutch language, ‘schatjes’ means ‘little treasures’, or ‘sweeties’, or, sarcastically: ‘not such sweeties after all’. 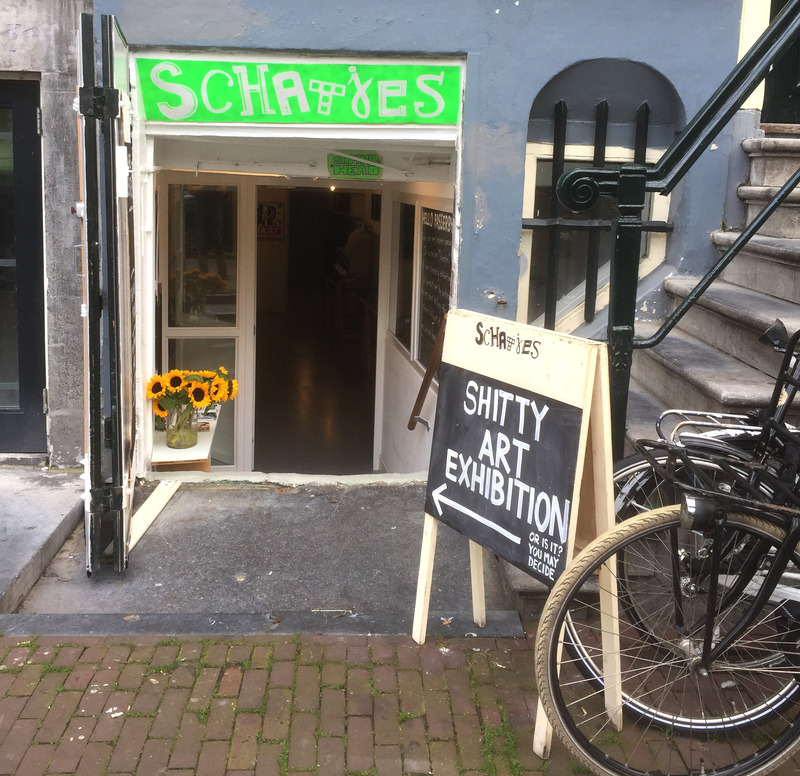 Accordingly, Schatjes is a space full of little treasures, both material and spiritual, that people can take home for a small (strictly material) fee. Response: Why yes indeed, the space does have a rich history! The house above the basement used to be the home of Peter Schat, an eccentric and experimental composer, who allowed the basement to be used by the Provo movement in the sixties. Aiming to disrupt political apathy and greed, they were a thorn in the side of the local government. The effects of their various provocative public actions are still present in the world today. In other words: they were total schatjes! (Or at least: they meant well.) If you want to learn more about the Provo movement, click on the period at the end of this unnecessarily long, but not frustratingly so, sentence. Response: Perhaps! Why don’t you fill out the artist exhibition request contact form on this page, and we’ll talk about it. Response: Perhaps! Why don’t you fill out the space rental request contact form on this page, and we’ll talk about it.